The Rice Village will be host to a pub crawl this Saturday featuring four Houston area breweries, including the two newest, Buffalo Bayou Brewing and Karbach Brewing. Start at any of the 5 participating locations. 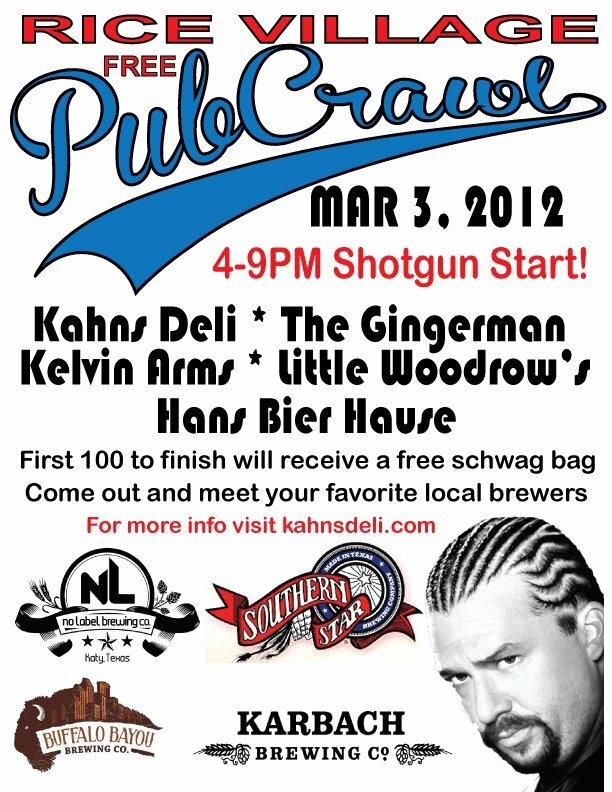 Kahn’s Deli, The Gingerman, Hans Bier Haus, Kelvin Arms and Little Woodrows, have a beer and receive a “Pub Crawl Passport”. Do the same at each of the following locations and get your passport stamped. Before 9PM bring your completed passport to Hans Bier Haus. 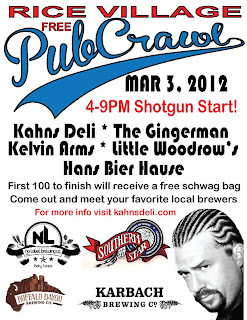 If you are among the first 100, you get a bag full of Beer schwag. All the locations area walking distance from each other and it looks like the weather should be perfect for it. My only question is why is Kenny Powers on the poster?